This species originated in the Mediterranean region. It is native to Europe (i.e. the UK, France, Portugal, Spain, Albania, Bulgaria, Greece, Italy, Yugoslavia and Ukraine), the Azores, the Madeira Islands, the Canary Islands, northern Africa (i.e. northern Algeria, Egypt, northern Libya, Morocco and Tunisia) and western Asia. Originally cultivated as a garden ornamental in the 1800's. It is no longer deliberately cultivated, though naturalised populations are regarded as being very useful to the honey industry. A very widely naturalised species that is most common in the southern parts of the country and has a scattered distribution in other regions. It is very common in south-western Western Australia, south-eastern South Australia, Victoria, the ACT and New South Wales. Less common in Tasmania, south-eastern Queensland, the southern parts of the Northern Territory, in other parts of South Australia and Western Australia. Also present in other parts of Queensland and naturalised on Norfolk Island. Naturalised overseas in southern Africa, New Zealand, USA and southern South America. Mainly a weed of temperate regions, but also relatively common in sub-tropical and semi-arid environments. 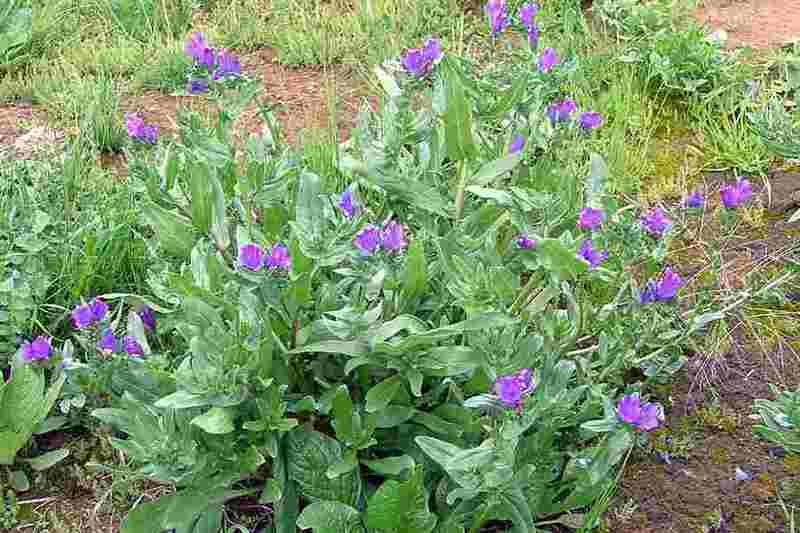 It inhabits pastures, crops, roadsides, disturbed sites, waste areas, grasslands, open woodlands and gardens. An upright (i.e. erect) and short-lived (i.e. 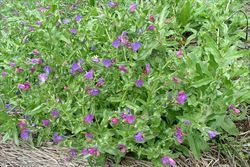 annual or occasionally biennial) herbaceous plant usually growing 20-60 cm tall, but occasionally reaching up to 1.5 m in height. 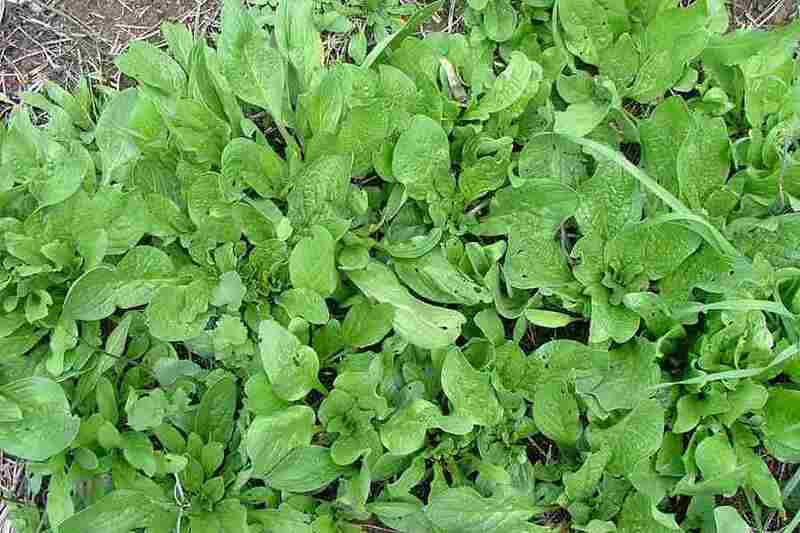 It forms a basal rosette of leaves during the early stages of growth. 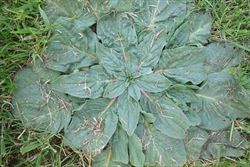 an upright and short-lived herbaceous plant initially producing a basal rosette of stalked leaves. its stems are covered in stiff hairs. 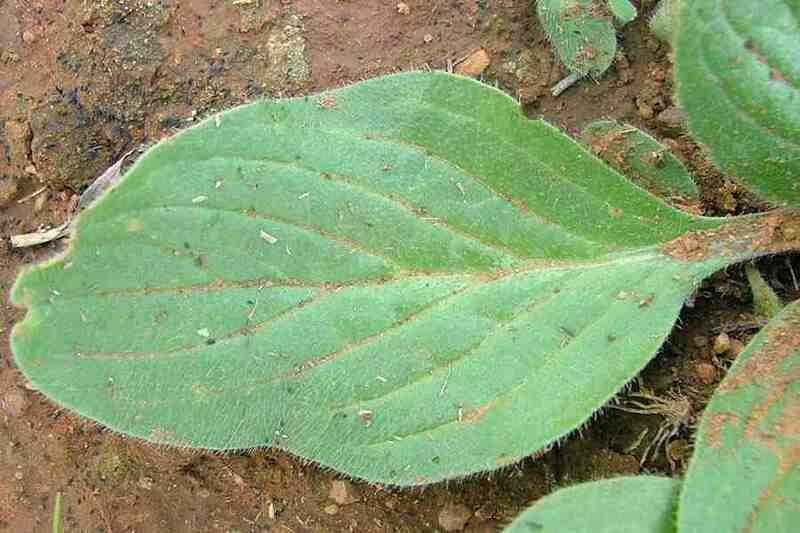 its entire leaves are hairy, with those on the stems being alternately arranged and stalkless. 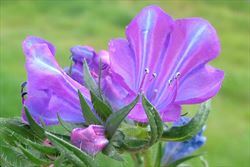 its purple or blue (rarely pink or white) tubular flowers (20-30 mm long) are borne along one side of a short coiled stem. these flowers have five stamens, two of which are significantly longer than the others and extend beyond the flower tube. its fruit is a cluster of four 'seeds' (2-3 mm long) that are surrounded by five bristly bracts. Its two seed leaves (i.e. cotyledons) are rounded or oval (i.e. elliptic) in shape with rounded tips (i.e. obtuse apices). They are borne on short stalks (i.e. petioles) and are somewhat hairy (i.e. pubescent). The first true leaves are oval (i.e. elliptic) in shape with rounded tips (i.e. obtuse apices). They are covered in long hairs and have a prominent central vein (i.e. midrib). Several upright (i.e. 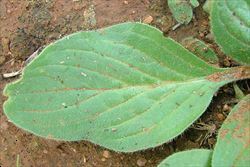 erect) much-branched stems arise from the basal rosette of leaves. These stems are green in colour and covered in stiff hairs or bristles (i.e. they are hispid). 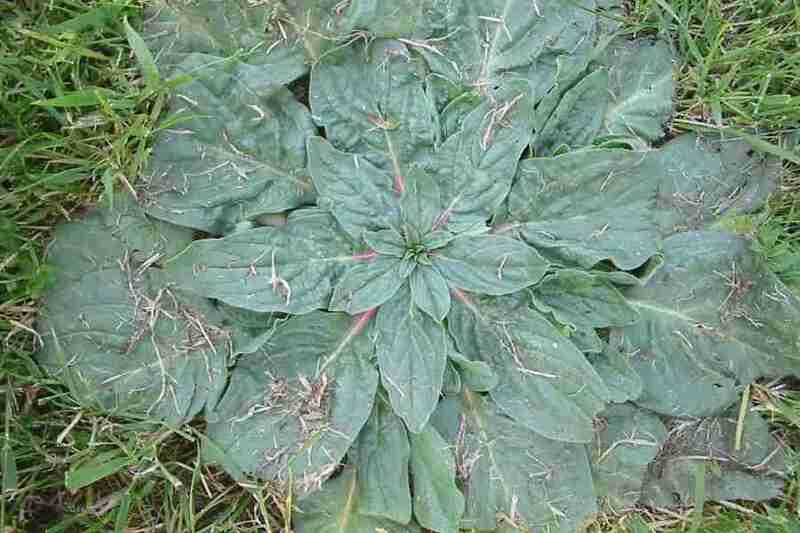 Rosette leaves are large (5-25 cm long and 1.5-10 cm wide), oval or oblong in shape, with stalks (i.e. petioles) up to 6 cm long. These leaves have entire and often wavy (i.e. undulating) margins and rounded tips (i.e. obtuse). Stem (i.e. cauline) leaves are smaller and narrower, alternately arranged, and have pointed tips (i.e. acute apices). They are stalkless (i.e. sessile) and sometimes even stem-clasping. All leaves are somewhat hairy (i.e. pubescent). The tubular flowers (20-30 mm long) are usually purple or blue in colour (rarely pink, reddish-purple or white). They are borne along one side of a short curved or coiled stem (i.e. in a boragoid inflorescence). These flowers have five petals that are fused into a tube (i.e. corolla tube) for most of their length and five elongated (i.e. linear-lanceolate) hairy sepals (8-11 mm long). They also have five stamens, two of which are significantly longer than the others and extend beyond the flower tube, and a very long style topped with a small two-lobed stigma. Flowering occurs mostly during spring and summer. The fruit is a cluster of four 'seeds' (i.e. 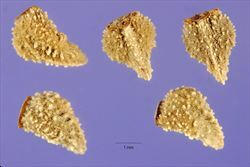 nutlets or mericarps) that are surrounded by five bristly bracts (i.e. the persistent sepals). The 'seeds' (2-3 mm long) are brown, grey or black in colour, woody, three-angled, and roughly textured (i.e. strongly wrinkled and pitted). This species reproduces by seed. 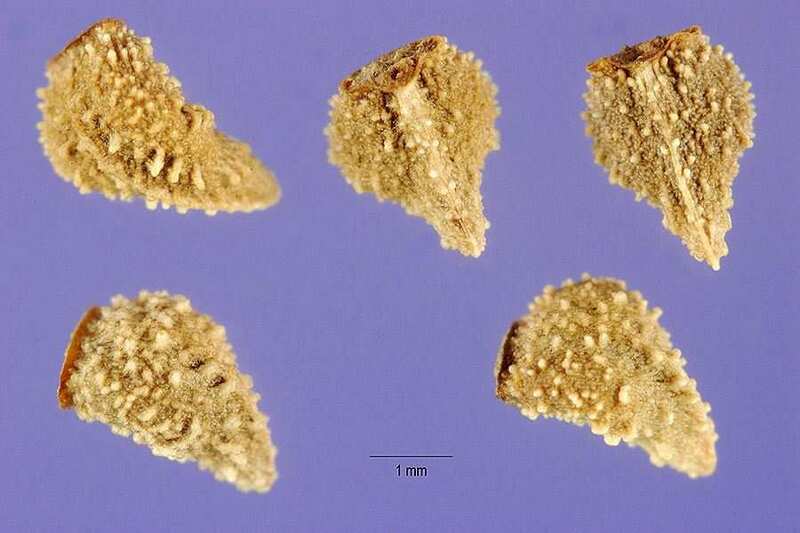 These seeds that are dispersed by water, animals and as a contaminant of agricultural produce. Paterson's curse (Echium plantagineum) is regarded as a significant environmental weed in Victoria, the ACT, South Australia, Western Australia and New South Wales, and an environmental weed in Tasmania, Queensland and the Northern Territory. 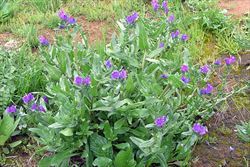 It is very widespread and troublesome, recently being listed as a priority environmental weed in nine Natural Resource Management regions. This species occurs in various natural habitats including grasslands, open woodlands and heathlands. It quickly establishes large populations in disturbed areas and can form very dense stands that compete vigorously with smaller native plants and impede the regeneration of overstorey vegetation. 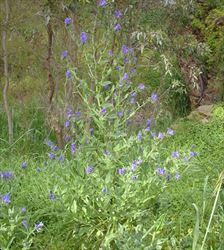 Paterson's curse (Echium plantagineum) is common in numerous conservation areas in southern Australia (e.g. Flagstaff Memorial Nature Reserve and Pulletop Nature Reserve in southern New South Wales, Brownhill Creek Recreation Park and Marino Conservation Park in South Australia and Bendoc Nature Conservation Reserve and Roslynmead Nature Conservation Reserve in Victoria). 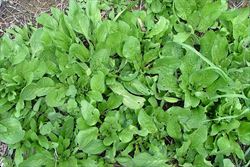 In fact, it is one of the top three most commonly occurring environmental weeds in conservations areas in Victoria (i.e. it has been recorded in over 40 conservation parks in this state). Paterson's curse (Echium plantagineum) is also common in threatened eucalypt woodland communities of the Avon Wheatbelt region in south-western Western Australia and is an important environmental weed in terrestrial reserves in the Shark Bay region. 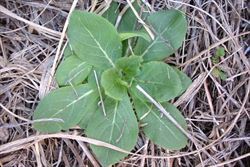 Paterson’s curse (Echium plantagineum ) quickly replaces other more palatable plants in heavily grazed pastures, reducing the value of the pasture and replaces the natural vegetation of the area. Though it is occasionally considered useful in some semi-arid rangeland pastures, it costs Australian graziers approximately $30 million every year in lost production and control costs. 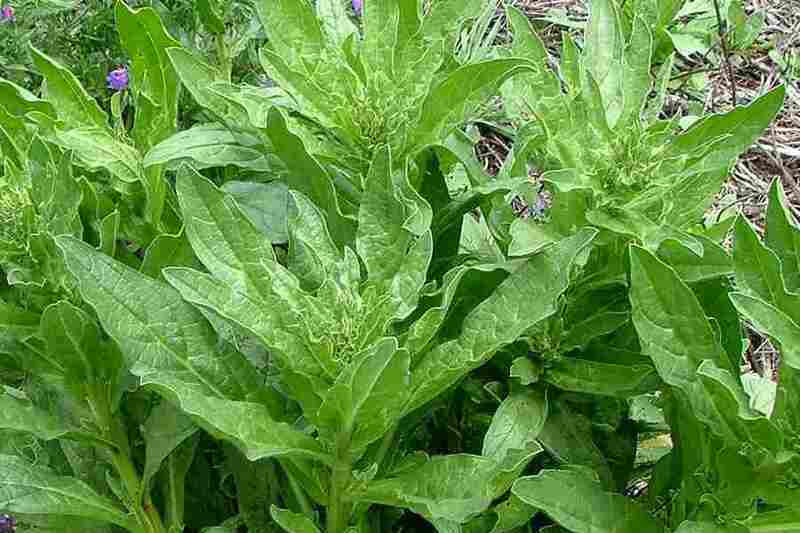 It can sometimes also be poisonous to livestock, being particularly toxic to pigs and horses, and may also cause skin irritations and hay fever in humans. Paterson’s curse (Echium plantagineum) is also a common weed of crops in the temperate regions of Australia. ACT: C3 - a pest plant that must be contained. 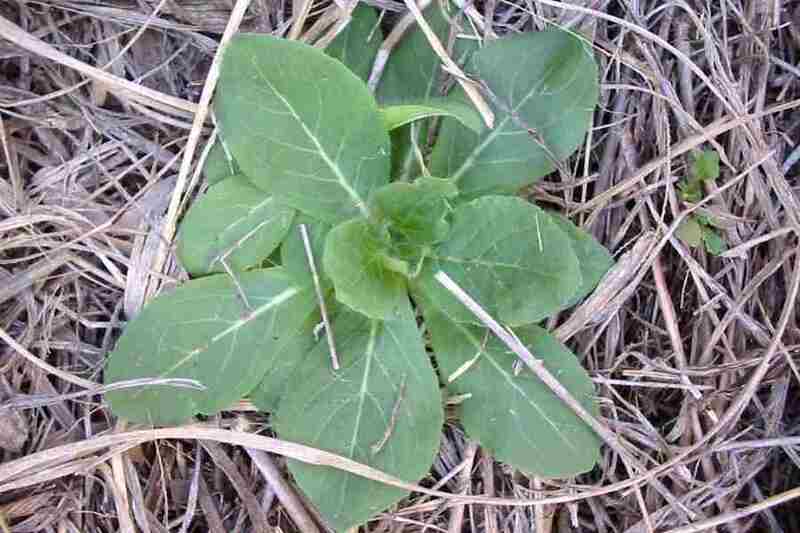 New South Wales: Class 4 - a locally controlled weed. The growth and spread of this species must be controlled according to the measures specified in a management plan published by the local control authority and the plant may not be sold, propagated or knowingly distributed (in a large number of local authority areas). 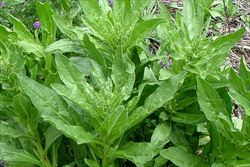 See the New South Wales Department of Primary Industries Noxious Weeds List at http://www.dpi.nsw.gov.au for more detailed information on which local areas are covered in these declarations. This declaration also applies to all Echium spp. South Australia: 3n* - this species is declared in part of the state only and control is only required in those areas. 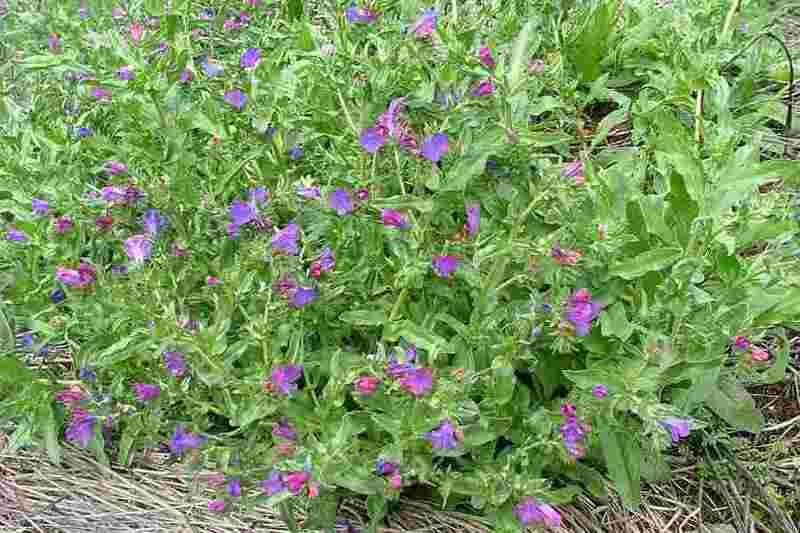 It is declared under Class 3h and is mostly a weed of agricultural areas. See the Consolidated Proclaimed Plants List, produced by Primary Industries and Resources, South Australia, for more information on the areas covered by this declaration. Victoria: C10 - a regionally controlled weed in the Wimmera, Glenelg, North Central, Corangamite, Port Phillip West, Port Phillip East, Goulburn, North East, West Gippsland and East Gippsland regions, where landholders must take all reasonable steps to control it and prevent its spread on their land and the roadsides which adjoin their land. Western Australia: P1 - the movement of this species or its seeds is prohibited (throughout the entire state), P3 - a weed which cannot be eradicated in the short term, but must be kept under 'control', (in some parts of the state), and P4 - it must be 'contained' (in some parts of the state). See the Western Australian Department of Agriculture and Food Declared Plant List at http://www.agric.wa.gov.au/ for more detailed information about which areas are covered by these declarations. the Victorian Department of Primary Industries Landcare Note on this species, which is available online at http://www.dpi.vic.gov.au. the Tasmanian Department of Primary Industries and Water Weed Service Sheet on this species, which is available online at http://www.dpiw.tas.gov.au. Paterson's curse (Echium plantagineum ) is an upright (i.e. erect) plant that has much-branched stems and basal leaves that are oval (i.e. elliptic) or oblong in shape. 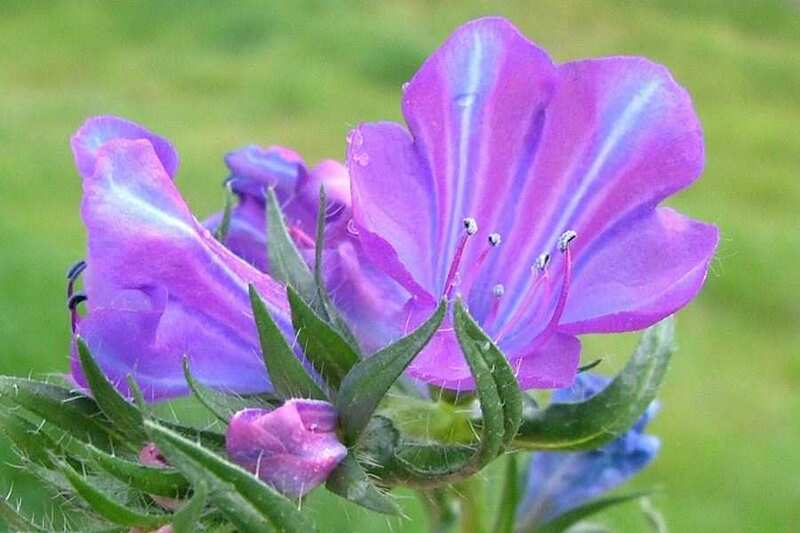 Its relatively large (20-30 mm long) purple or bluish tubular flowers (rarely white or pink) have two longer protruding stamens and three shorter stamens. 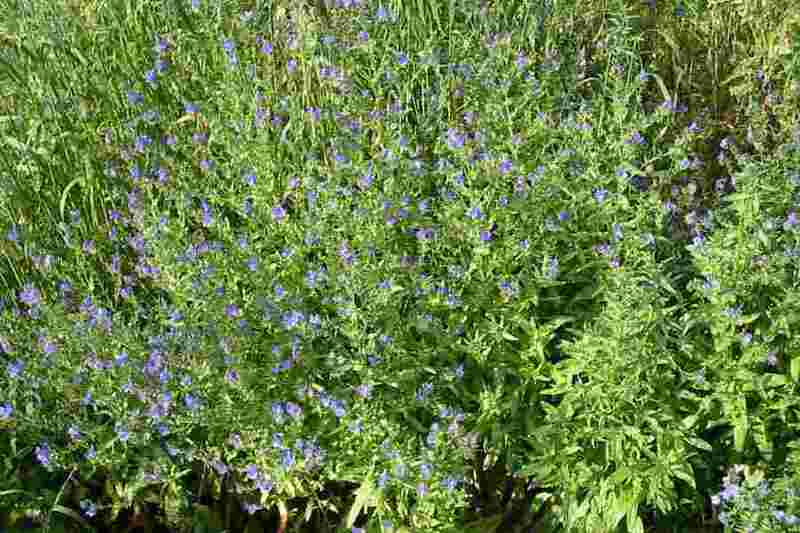 viper's bugloss (Echium vulgare) is an upright (i.e. erect) plant that has mostly unbranched stems and basal leaves that are elongated or narrow (i.e. oblanceolate or linear) in shape. Its moderately-sized (15-20 mm long) blue tubular flowers have four longer protruding stamens and a single shorter stamen. 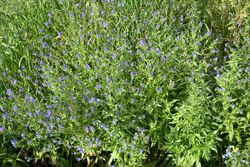 Italian bugloss (Echium italicum) is an upright (i.e. erect) plant that has mostly unbranched stems and basal leaves that are oval (i.e. elliptic) or elongated in shape. Its relatively small (10-12 mm long) pink, white or yellowish tubular flowers have five protruding stamens, two of which are slightly larger than the others. Paterson's curse (Echium plantagineum) is also somewhat similar to the heliotropes (Heliotropium spp.) and the yellow burrweeds (Amsinckia spp.). However, all of these species can easily be distinguished from Paterson's curse (Echium plantagineum) by their smaller flowers (less than 10 mm long and 3-6 mm across) which are often also white or yellow in colour.